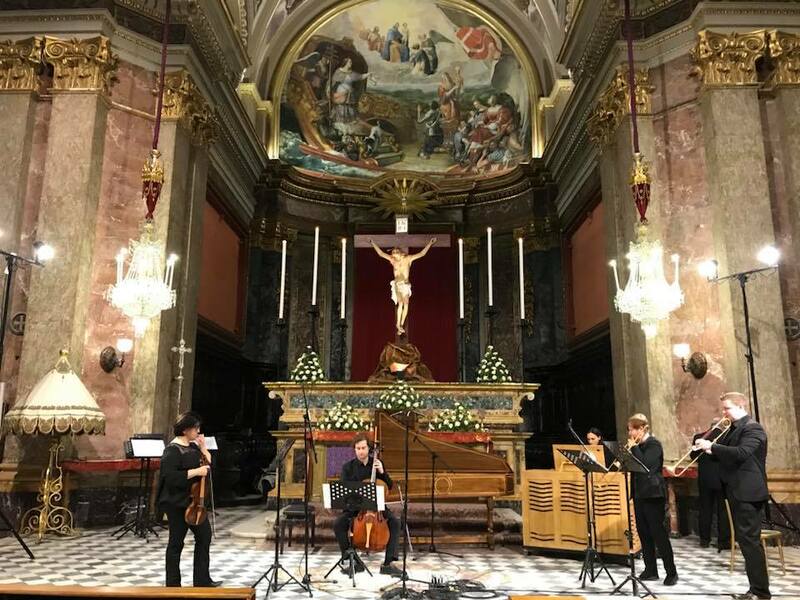 The Teatru Manoel presented a concert on the occasion of the European Day of Early Music (Wednesday 21st March 2018) at the Basilica of St. Dominic in the European Capital of Culture 2018: Valletta. Valletta is on the island of Malta in the Maltese Archipelago. I have been very fortunate to visit on two previous occasions (January 2013 and January 2015). It was great to return two subsequent times for this ambitious and developmental project with the Valletta International Baroque Ensemble (VIBE). The VIBE had specially devised a concert programme entitled ‘Music at the Court of Kroměříž’. The varied programme featured music by Schmelzer, Vejvanovsky and their contemporaries, as well as other related composers. The programme included instrumental music, vocal features, antiphonal music in larger consorts and more intimate ensemble repertoire for smaller combinations of instruments. The first of our two trips to Malta (Monday 12th March until Wednesday 14th March) enabled an Early Brass Workshop (in this instance with Sue Addison (sackbutt) and Russell Gilmour (natural trumpet)) to take place. Sue and I were working with skillful musicians from the Malta Philharmonic Orchestra and also from the Armed Forces of Malta - players who are fairly new to Historically Informed Performance styles but who seem to be really enthused by it. Our job was to give the players confidence, the relevant style coaching for the various types of music we were to perform, and to offer technical advice for playing on older instruments. Our approach was to play alongside these talented players and to play as much of the music as we could, in order for everybody to get accustomed to: the stylistic sound-world, each other, the intonation/temperament, the repertoire, the mouthpieces and the instruments. This preliminary workshop took place over a week before the performance, giving the players opportunity in the interim to digest the stylistic information and to study and experiment for themselves in their personal practice. I find that it helps to study something in depth, then leave it alone in order to be able to return to it afresh after a few days. I often find that the learning has somehow matured in the process and also that the earlier progress has become more secure and facile. The workshops gave us an opportunity to work on this demanding programme without an imminent deadline. It was great to rehearse with the brass and string players of the VIBE. This preparatory work was rewarding and very worthwhile. 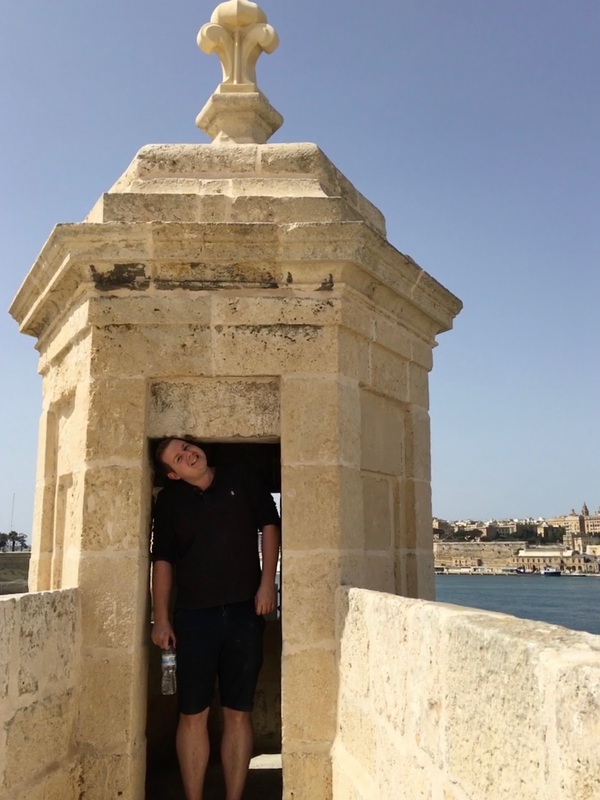 Visiting Malta in the week before the performance also helped me to prepare for the practical demands of this complex programme. I decided to write out some of the trumpet parts to eliminate awkward page turns, and I bound the trumpet parts into a booklet (so I wouldn’t get the pages in the wrong order). In between the workshops, Sue and I were able to enjoy the wonderful city of Valletta. It is truly a beautiful city and it was so fantastic to see some sunshine (the UK had been snowy when we left Gatwick Airport). 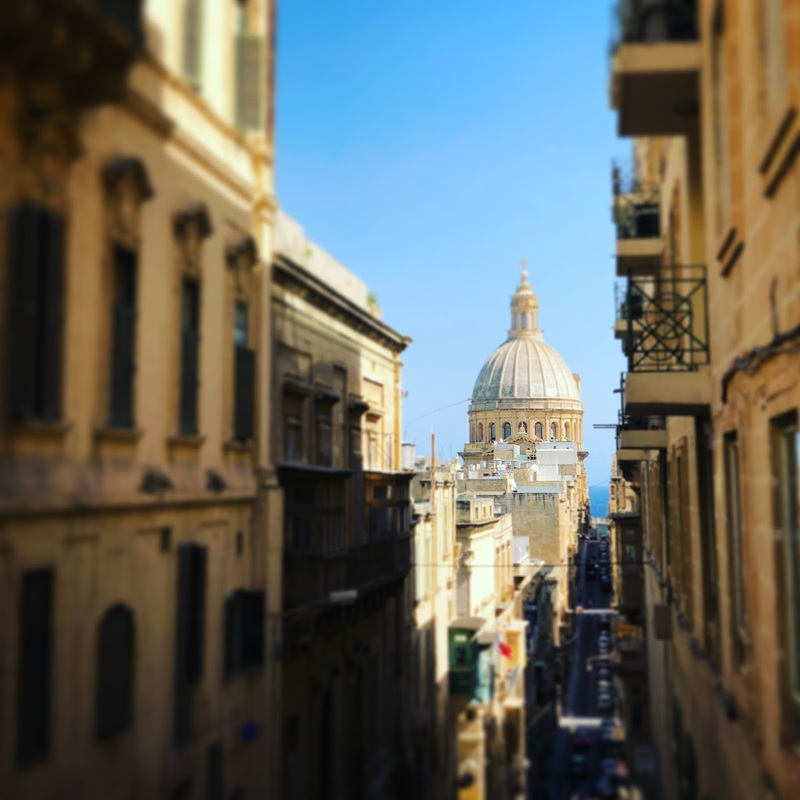 I was amazed by our daily step-count on this trip - achieved by pottering around Valletta, to and from rehearsals, and on walks exploring the city. Our second visit took place between Monday 19th and Thursday 22nd of March, with the performance in the evening on Wednesday 21st March 2018. On this occasion we also had Richard Thomas (Cornetto & Natural Trumpet) and Adrian France (Bass Sackbutt) with us. 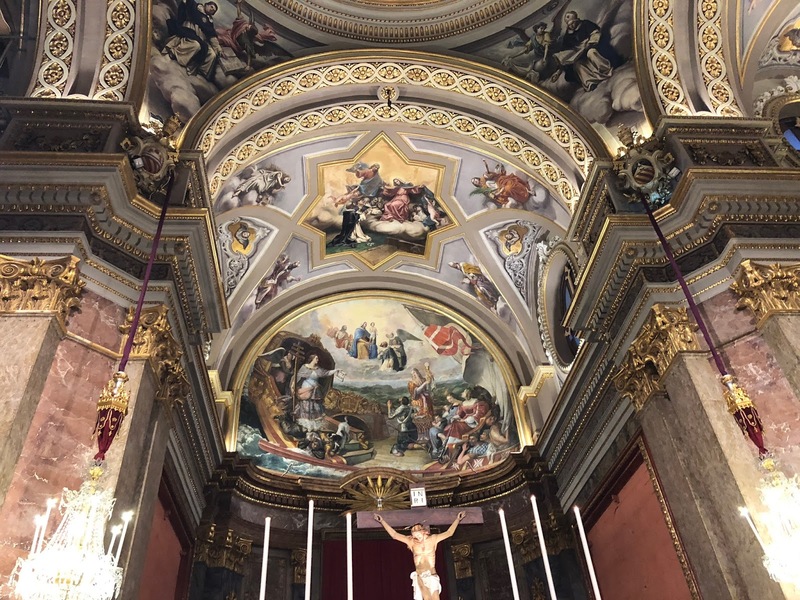 We worked with the Valletta International Baroque Ensemble and spent several enjoyable days rehearsing in various studios at the Teatru Manoel before relocating to St Dominic’s Church on Merchant Street. The change of acoustic elevated the sound of the ensemble and the group had two days of rehearsal to acclimatise to the acoustic of this magnificent church. The peninsula of Valletta measures 900 metres by 630 metres and within that area there are more than 25 churches. 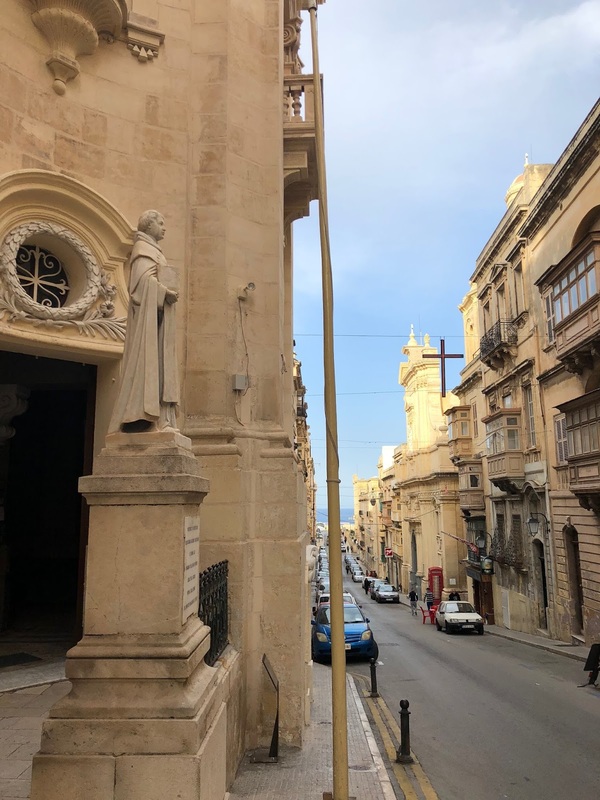 [Incidentally, St. Dominic’s church is diagonally opposite St. Nicholas' Church - where I had performed Bach's Brandenburg Concerto No.2 [BWV 1047] at the Valletta International Baroque Festival in 2013.] 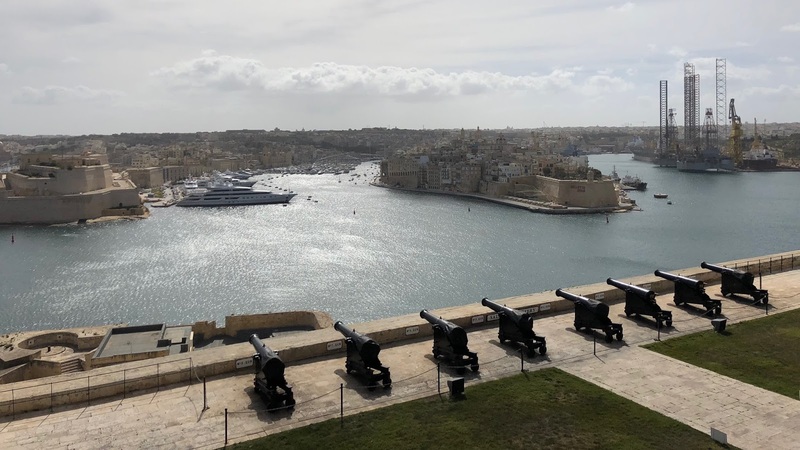 Valletta is a truly remarkable place with a fascinating history. On the day of the concert we had a relaxed morning. After breakfast, Sue and I decided to go on an excursion to enjoy the sunshine and explore a little more. 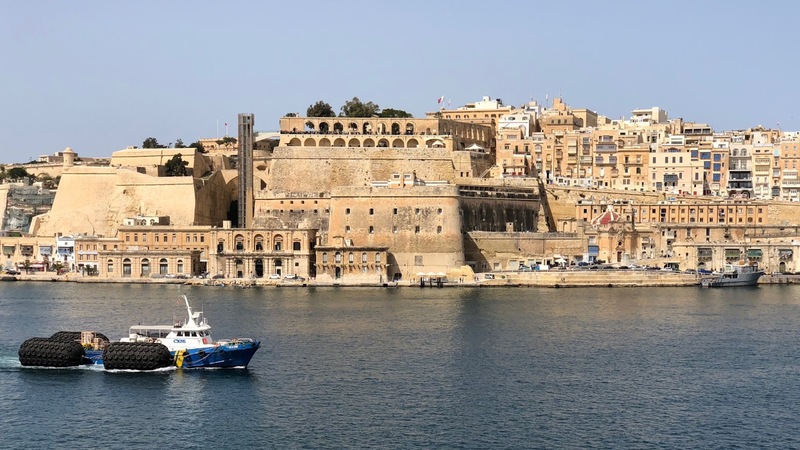 We walked to the Barrakka Gardens (enjoying the wonderful view over the Grand Harbour) and we took the Barrakka lift down to the Valletta Waterfront to make the short ferry crossing to The Three Cities (Birgu, Senglea and Cospicua) on the opposite side of the Grand Harbour. 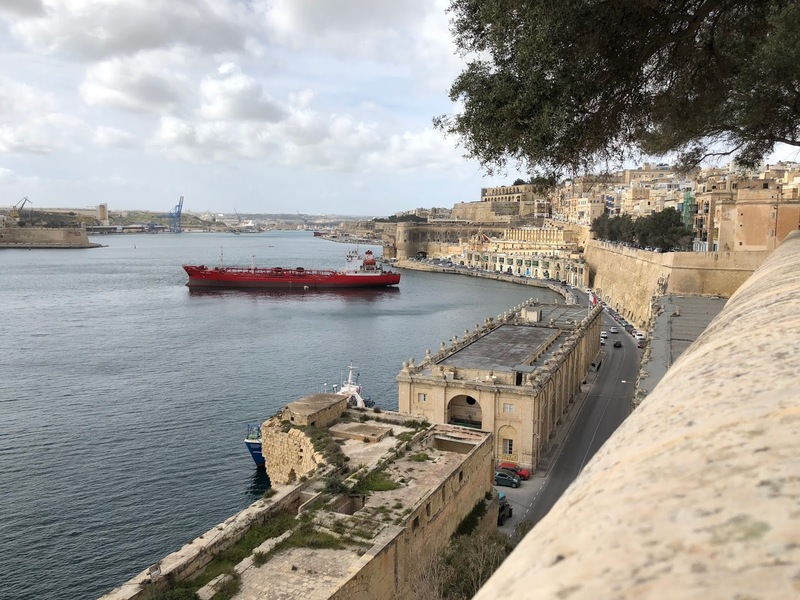 We visited Fort St. Angelo in Birgu and enjoyed exploring the history, the ramparts and its commanding views from its central (and heavily fortified) location in the Grand Harbour. It was a relaxing and memorable way to enjoy the morning. After lunch we rehearsed the programme in concert order, top and tailing the pieces with all of the instrumentalists and singers. In programmes with different formations for each piece it is really important to rehearse in order as much as possible. The concert began at 20:00 with the five movements of Schmelzer’s Balletto a Cavallo. The piece featured five natural trumpets and timpani, with trombones playing the lower trumpet parts. Later movements featured the string section, with imitative material played by the top two trumpet players and the piece continued to alternate between string and brass sounds. It was a rousing introductory piece, featuring all of the players from the outset. The next movement, Vejvanovsky’s Sonata La Posta, featured the sackbuts and strings - and was a stark contrast to the opening piece. Staying with the music of Vejvanovsky, Sonata à Tre (for trumpet, sackbut, violin and continuo) featured Russell Gilmour, Sue Addison and Sarah Spiteri (with Jacob Portelli (cello) and Joanne Camilleri (organ)). It was an eclectic combination of instruments but the piece of music was very characterful and effective - at times the three featured instruments combined tenderly, and on other occasions individually delved into separate virtuosic solos. Adrian France took this photograph of us rehearsing this piece in St. Dominic’s Church. Vejvanovsky’s Seranada for two trumpets and strings was next in the programme. I played trumpet with Jason Camilleri - as I understand, this was his first public performance on the natural trumpet and he did a great job. The five movements of the Seranada were very fun to play and Nadia Debono (violin) led the strings with great style. 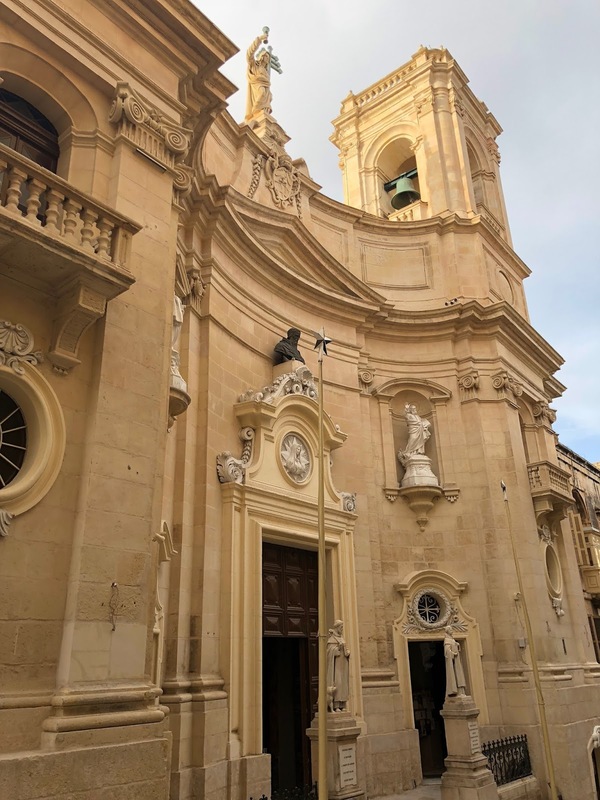 The next piece in the programme featured the first vocal features of the concert in Franzoni’s Sancta Maria for soprano (Gillian Zammit), bass (Albert Buttigieg), four sackbuts (Sue Addison, Roderick Bugeja, Jemond Azzopardi and Adrian France) and organ. The melody is similar to the one in Monteverdi’s Vespers. This setting with four trombones accompanying the bass was remarkable. Next, Gillian Zammit sang Monteverdi’s O quam pulchra es - she sang beautifully, accompanied by just the organ. Returning to the music of Schmelzer, a larger antiphonal ensemble performed Sonata a Otto, due cori, with the strings on the left and the brass on the right. This featured increasingly chromatic melody and harmony, with exemplary cornetto playing by Richard Thomas on the side with the trombone choir. Sonata a Quattro by Tuma was next in the programme and this was a great chance for Sue and Roderick (sackbuts) to duel with the equally virtuosic violinists opposite. The next piece in the programme gave the brass a welcome rest and allowed the string section to shine with Biber’s Fidicinium Sacro-Profanum (IV) - with these interesting viola parts (played by Matthew Fenech and Daniel Zammit) in the mix. This is a fantastic piece and it was very well rendered by the strings and continuo of the Valletta International Baroque Ensemble. After an efficient reset of the stage, the four sackbuts, bass soloist (Albert Buttigieg) and basso continuo performed Herr nun last du Deinen Diener by Ahle. This beautiful piece received a very warm reception from the audience. 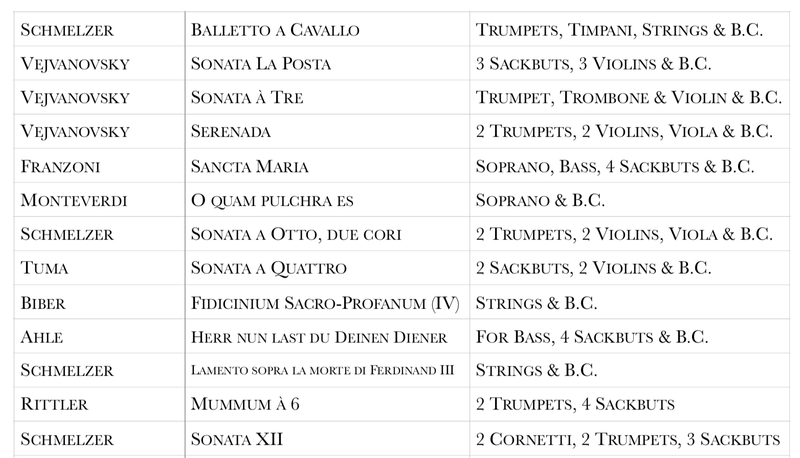 After the Lamento sopra la morte di Ferdinand III by Schmelzer from the strings alone, the brass (alone) reciprocated with a performance of Rittler’s Mummum à 6 - which is an extraordinary piece for for just two natural trumpets and four sackbuts (performed without continuo). The edition is by my good friend Johann Plietzsch. This piece of music is incredible in its rhetorical complexity and it is always a thrill to play it. It utilises the 7th partial (B-flat) of the harmonic series on the natural trumpet - which gives a recognisably colourful sound and the sackbut parts harmonically undulate between E-flat major and C minor with a sense of freedom. I remembered playing this piece of music at Dartington International Summer School and subsequently at Saint Mary the Virgin Church (SW19 3HJ) in Wimbledon for the funeral of the brass instrument maker and collector Frank Tomes. David Staff and I played on our trumpets - the first trumpet Frank made and the last trumpet Frank made, respectively. Sue Addison, Martyn Sanderson, Guy Morley and Pat Jackman played on alto, tenor and bass sackbuts that had been made by Frank Tomes. It was a fitting tribute to an incredible man and a very curious piece of music that would have intrigued a very inquisitive, kind, and fascinating gentleman. The concert came to a conclusion with more music by Schmelzer. Sonata Duodecima is another fantastic piece of music, originally for two cornetti, two natural trumpets and three sackbutts. We varied the instrumentation to a violin and just one (!) cornetto instead of two cornetti - this is thought to have been a fairly common practice in Renaissance times anyway. The piece opens with an imitative arpeggiated theme, develops throughout a triple section and returns to a final common time section with virtuosic cornett(ino?) parts and a flourish of more arpeggiated trombones and trumpets toward the end of this incredible piece. The performance was a great achievement and the newer performers and workshop participants had risen to the challenge of performing this music on appropriate instruments, and they reached a very pleasing standard. There was a remarkable team effort from all involved. That said, the work of Sarah Spiteri and Sue Addison in planning, scheduling and programming such a complicated and ambitious project cannot go unrecognised - thank you to them and to all involved in this wonderful collaboration in Valletta. 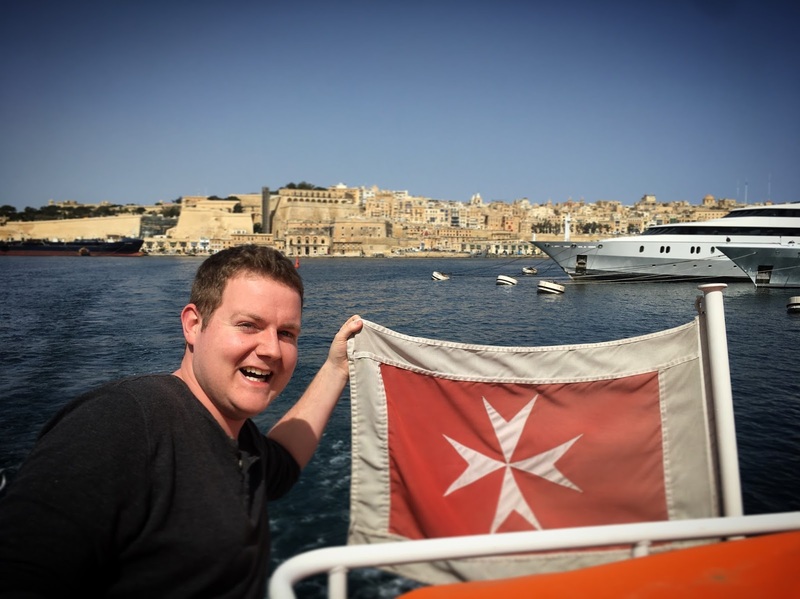 I left Malta feeling inspired and I thoroughly enjoyed the project and collective experience.